The Old Foodie: Sundae any Day. "... I shall remember that ice-cream all my life. In a sumptuous confectioner's shop, light, airy, full of fragrance, we were served with a mountain of coffee ice cream, sprinkled with cream and scattered with walnuts, honey, peanuts, and various fruits. When I carried the first spoonful to my mouth...my taste buds experienced a violent ecstasy. A whole opera of sensation rolled off my tongue ..."
Henri must have eaten ice-cream before, of course – they do have ice-cream in France, but French ice-cream is of the exquisite but austere kind, not this totally over-the top dressed-to-kill, operatic mountain of abundance. Ice-cream did exist before “America”, but it does seem as if Americans did invent the sundae. The invention happened sometime in the second half of the nineteenth century, perhaps as an almost illicit treat on Sunday when many states had “blue laws” regulating the sale of anything except newspapers, milk, and ice on the Sabbath. The spelling was changed to confuse or appease the offended religious, and “Sunday” became “Sundae” - or so the story goes. There is one particularly glorious and over-the-top form of sundae however which is entirely English, or at least, all references are as an English treat. I refer of course, to the “Knickerbocker Glory”. English to the last lick. Or is it? The name is unequivocally American – “Knickerbocker” is a Dutch-American surname, and the name of a New York basketball team, and “knickerbockers” are the American version of knee-breeches (which are the same as golfers’ “plus fours”). Which of these lent its name to an ice-cream sundae served in a tall, tall glass? And how did it get to be English? One of the many delightful theories is that the name comes from the colourful layers of the ice-cream and its embellishments (cream, custard, jelly, fruit …. ) in the requisite tall, tall glass, which resemble the stripes on knickerbockers (or the hose worn with them). It is a good enough theory for me, until a better one comes along. It seems that perhaps the Knickerbocker Glory was a brief fashion in America, for there is a recipe for it in a Soda Fountain manual of 1915 – and fashion is the operative word, for staying one step ahead of the competition was an essential skill for soda fountain operators. During Prohibition in America, displaced bartenders swelled the ranks of soda jerks and wreaked their own creativity on ice-cream sundaes, and fashions changed even more quickly than hemlines. By the 1930’s it had migrated to England (we will probably never know who packed it up and bought it a ticket), where, in the absence of any competition, the briefly famous and quickly forgotten American Knickerbocker Glory, became a naturalised and enduring English Celebrity. You can still order one at the seaside today. Ice cream, 4 ounces; chocolate syrup, 1/2 ounce; raspberry crushed fruit, 1/2 ounce; whipped cream, 3 ounces; 2 brandied cherries. Place the ice cream in a glass and add chocolate syrup, some of the whipped cream and 2 dashes of essence of rose. Add raspberry fruit and then balance of whipped cream and the rose essence; top with cherries. Each of the separate portions will appear as a separate layer in glass. This sundae should be served in a tall, narrow, 10-ounce, thin glass, and the dispenser in serving should insert long spoon to the bottom of the glass just once and draw slowly towards top, so as to slightly mix the ingredients. This is done for appearance only. 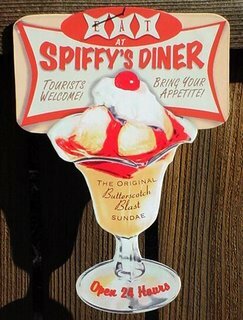 Fifteen cents should be secured for this sundae and all materials should be of the very best. Last year's story for November 1st was "Eating the Flower of Death". The sundae is a mixed drink and consists of ice-cream smothered in everything except young onions. Owing to the Prohibition wave thousands of skilful bartenders have been thrown out of employment, but most of them have since been hired to manufacture the ice cream sundae in long wriggling relays. Every few days some former barkeeper will bring out a new sundae which is harder to cook than a welsh rarebit in a hay cooker. The New Castle News, a Pennsylvanian newspaper, in 1916. Dont forget to enter the quiz! To see the details, scroll just a little further down to yesterday's post.